Her Majesty the Queen tries to keep peace in her realm between fighting factions while greeting us all to the faire. In this photograph, one of her loyal, yet Irish, subjects speaks of the advantages of being aligned to England and the Queen while one of his countrymen (at right coming up the steps) looks on in rage and disgust. The Killington Renaissance Festival, held at Pico Mountain the first two weekends of August (2004), has been running since 1998, but this was our first year performing for the faire. The festival, in effect, starts on Friday evening (before the gates at Pico Mountain open on Saturday) at several area restaurants including Cortina Inn, Cascades, Heli’s and the Red Clover Inn with “Royal Meals”, complete with menus from Elizabethan England. Entertainment is provided at several of the restaurants by the festival’s entertainers. The second weekend of the event also featured an evening performance of “Rosencrantz and Guildenstern Are Dead” by Tom Stoppard. The play is a hilarious interpretation of Shakespeare’s Hamlet, told from the view-point of Hamlet’s befuddled friends, Rosencrantz and Guildenstern. Our fellow musicians included a large group from Cape Cod called “The Solstice Singers”, performing madrigals, instrumentals and period songs incorporating acting and dance into their routine. They often perform Christmas concerts with the Boston Pops and were a great group of people to know. They have fun together and were eager to reach out to other musical groups. On our last day together we collaborated a bit, always a wonderful experience for everyone, including the audience. Also featured were a duo from Massachusettes called “The Harper and the Minstrel”, also known as Sellador, the Harper, and Tarma, the Minstrel. They play a lot of Irish pieces as well as compositions from John Playford, King Henry the Eighth, J.R.R. Tolkien and Turlough O’Carolan. Their performances are also sprinkled with a few of their own compositions. We all marveled at Sellador’s carved harp, fluid playing and flowing robes and Tamara’s beautiful vocals, which have a similar timbre to Loreena McKennit’s. 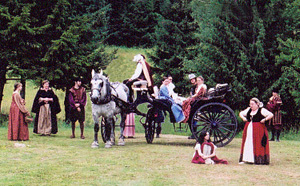 Sellador and Tamara also perform at King Richard’s Faire in Carver, MA and at the Maine Renaissance Faire in Lebanon, ME.